On Xbox One, one of the most popular features is Game DVR, which gives gamers easy access to recording, editing and sharing their most epic gaming moments. We’re bringing this feature to Windows 10, now accessible by simply pressing Windows key + G. With the games you love playing - whether on Xbox Live, Steam or other services - you can record, edit and share game clips with all your social networks. The Xbox button launches the Xbox app. The Record that button turns the last 30 seconds of gameplay into a game clip. This feature is disabled by default, but you can enable it under Settings. The camera icon is the Screenshot button. 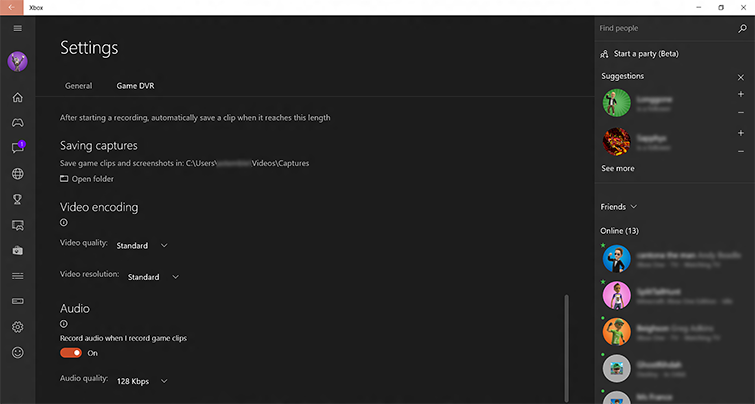 This captures window screenshots and puts the images in the File Explorer\Videos\Captures folder. Each screenshot is identified with the game’s title and metadata. The Record button starts and stops the recording and puts videos in the File Explorer\Videos\Captures folder. Each video is identified with the game’s title and metadata. Once recording has started, a timer shows you how long you’ve been recording. The Settings button opens a popup window that allows you to control some of the Game DVR settings. However, to access or change most of the settings, you’ll need to open the Xbox app, select Settings and then select Game DVR. The Move button lets you change where the Game bar will appear on the screen. If this is your first time using the Game bar with a game, you’ll be prompted to identify the programme as a game before the Game bar will appear, or before you can use any of the keyboard shortcuts. Click the tick box to confirm the programme is a game. Note If a PC game is in full-screen mode, the Game bar will be blocked from opening. 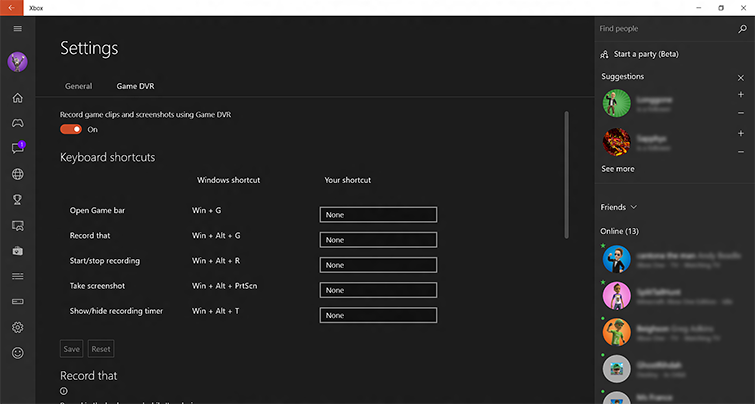 To use the Game bar or the shortcut keys, you’ll first need to adjust the game settings to open in Windowed mode. Once in this mode, press the Windows key + G to open the Game bar and then select the tick box Yes, this is a game. 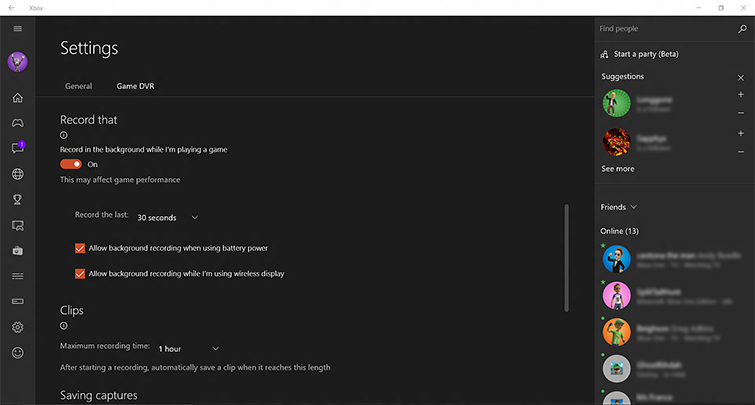 You can now either play in Windowed mode or switch the settings back to full-screen mode, but once in full-screen mode you’ll have to rely on the Windows shortcut keys, as the Game bar will be blocked. In this mode, use the Windows key + Alt + G and Windows key + Alt + R sequences to create your recordings. The other keyboard shortcut combinations will not work in full-screen mode. You also have the option to add your own shortcuts. To do so, open the Xbox app and go to Settings > Game DVR > Keyboard shortcuts. Note Keyboard shortcuts won’t work until the programme has been identified as a game (see the instructions above). 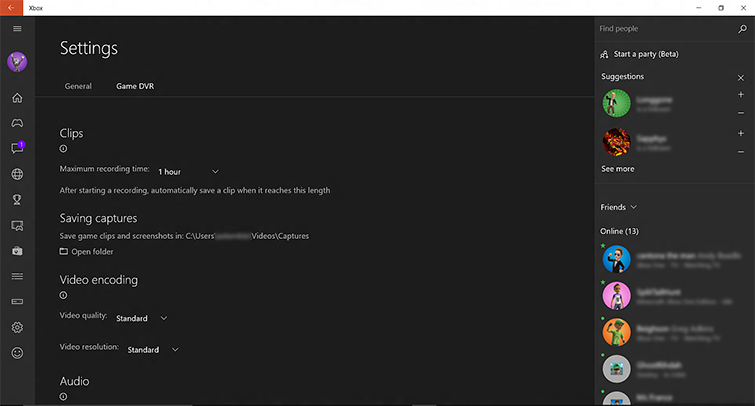 Open the Xbox app and select Settings from the left-hand side menu option. Then, select the Game DVR tab. The first option in the list is the ability to turn the Game DVR functionality on and off. It is on by default. Keyboard shortcuts shows you the current mapping of the Windows shortcuts. You can remap them to your own shortcut keys - which will be necessary if your game blocks the use of the Windows key. How long the recording clips will be by adjusting the Record the last option. This is defaulted to 30 seconds, but you can shorten or lengthen that time. Whether you want Game DVR to function while your laptop or tablet is plugged in, as it does use extra power. Whether you want to disable this feature whenever you’re using wireless display, as it does use GPU resources. Clips: You can adjust the maximum length you want to allow for game clips. Default is 1 hour, but you can shorten or lengthen that time. Saving captures: This shows you the folder location of your screenshots and game clips, as well as gives you a button to launch File Explorer to that exact location. Note You can’t change the storage location of your screenshots or game clips. Video encoding: This allows you to select the video quality. You can choose between 720p and 1080p resolution, and between Standard bitrate and High bitrate, measured in millions of bits per second for the bitrate of the encoded MP4 file. The higher the bitrate, the higher the quality. Audio gives you the option to record with or without sound and to select the audio quality. Would you like to contact Support regarding the "Record game clips with Game DVR on Windows 10" issue you were reading about or a different issue?